SPORAH TV: I WAS INVOLVED WITH GUN CRIME BEFORE! I WAS INVOLVED WITH GUN CRIME BEFORE! Black men 'to blame for most violent city crime'... but they're also the victims! Annual figures show that black people are at least six times more likely! I WAS INVOLVED WITH A GUN CRIME BUT I KNOW BETTER NOW! Gun crime still makes up a small percentage of all crimes committed in the UK. Over the past few years, there have been a lot of stories in the news where teenagers have been killed by someone carrying a gun. Wha can we do to stop KNIFE/GUN crimes?. Wow! good work sporah, But i think One thing is missing!! The latest crime statistics involving guns in the UK. 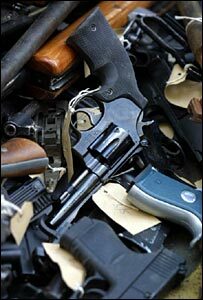 Personally i would like to know crime statistics involving guns in the UK especial for our community. dm you do print the truth !!! Nimeipenda hiyo, If you carry a Gun you will die by a Gun. Asante kwa kuelimisha jamii, Mungu akuzidishie. Spora my sister, Black youths are suspected of more than half of knife crime among children in the UK, according to confidential Scotland Yard figures. A highly-sensitive report reveals that 124 of the 225 under-18s legally 'proceeded against' for knife offences are from the black community. Yet in the overwhelming majority of reported cases of knife crime involving young people, the victims are white. So ???????????? !!!!!!!!!!!!!!!!!!! Let Parents educate their children about this! Thanks for putting up this show. Why is it in the exclusively whites areas that when a white commits a crime against another white it is just a plain old crime but when a black person commits a crime against another black person it is stigmatised. Are we saying whites do not commit crime. This is London where yes possibly blacks make up majority of the perputrators and victims. Crime should not be given a colour, crime is crime. If you was to take away all ethnic minorities would there still not be crime? There are many that would say yes there would be less crime. But take look back into history and see that the Borstals being built were for white working class lads, prisons were built long before immigrants were coming here, who were they being built for? There is NO any evidence that this issue is solely or disproportionately an issue for black young men!